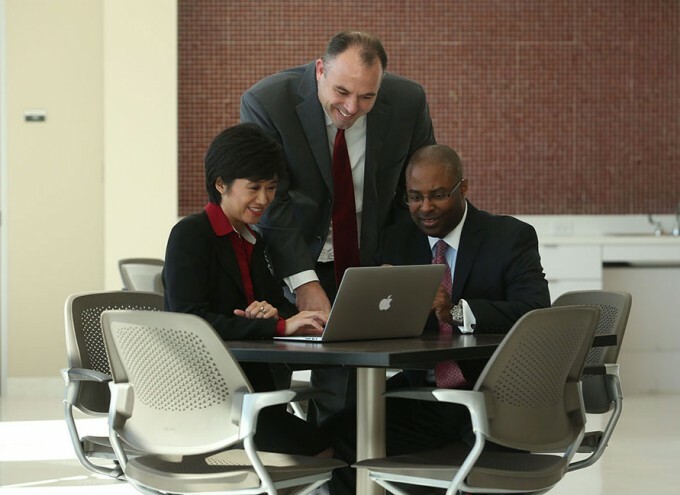 Students in the Executive MBA program at the C. T. Bauer College of Business at the University of Houston now have access to the leadership development tools and coaching that presidents, CEOs and heads of companies across the globe use. Bauer College has partnered with talent management firm Korn/Ferry International, launching an extracurricular component to its Executive MBA program called Bauer CareerEDGE, which leverages Korn/Ferry’s proprietary intellectual property, research and assessments. According to Daniel Currie, assistant dean for graduate programs at Bauer, the partnership between the college and Korn/Ferry highlights both a unique opportunity for executive education in the Houston market, as well as the increasing need to provide graduates with takeaways on leadership that can be applied in their own organizations. “Beyond technical competencies, we’ll be providing a focus on actionable leadership skills and practices drawn from the greater self-awareness and mental agility that the Korn/Ferry program engenders,” Currie said. Value-add for the program – Bauer College is the only Executive MBA program in Houston with this unique offering for students, which includes assessments from peers, direct reports, customers and supervisors, as well as executive coaching from staff in the college who have been trained to deliver Korn/Ferry’s proprietary executive development tools. Business schools play a key role in closing the “leadership gap.” – Bauer emphasizes leadership development at all levels. With this offering for Executive MBA students, the college is addressing industry concern that employees are often hired for their technical skills but find it difficult to adapt to challenging situations due to a lack of “soft skills.” The goal of the Bauer CareerEDGE program is to enhance and complement what students are learning in the classroom, allowing them to develop individual plans for increasingly higher levels of responsibility throughout their careers. To launch Bauer CareerEDGE, the college offered it to students entering the first semester of their Executive MBA programs in August. Korn/Ferry and Bauer worked together to develop a leadership competency model for the Executive MBA program, using Lominger’s Leadership Architect competency library. Participating students were then assessed on these competencies through the Voices 360 feedback assessment. They also took a self-assessment that provided them with feedback on their learning agility. Throughout the rest of the academic year, students will meet with a coach from the college to discuss the results of their assessment and create a high-impact development plan, tracking the progress as they complete the program. “We believe, as Korn/Ferry does, that talent management drives business success, and offering Bauer CareerEDGE gives our students another tool to develop themselves as leaders,” Currie said, adding that the college plans to continue offering the program to future Executive MBA classes. Pingback: Reconnect | Latha Ramchand, Ph.D.